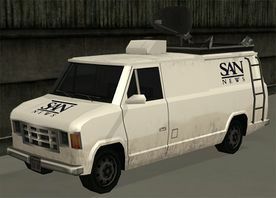 A Newsvan in GTA San Andreas. 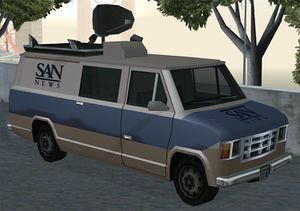 The Newsvan is, as self explained, a news van in Grand Theft Auto: San Andreas. The Newsvan is designed as a news van for SAN News, with a satellite dish on the roof, and its rear compartment containing crudely rendered broadcasting equipment as well as a chair. It has no special function (despite having a satellite dish), and is not important to any missions. The front appears to based on a fourth generation Ford Econoline but the sides seem to be from the third generation Econoline. The sides could as well be from a 1979–1993 Dodge Ram Van since the taillights seem inspired from one. The performance of the Newsvan is moderate-to-excellent, with a moderate acceleration with good torque, a good top speed, good hill climbing capabilities, and good durability. Due to its height, however, it has a tendency to flip if driven over rough terrains. The Newsvan's braking is very good. The white Newsvan from "Cut Throat Business". In the mission Cut Throat Business there is a chance to get an indestructible Newsvan with a unique white color. The player may simply fail the mission by failing to chase the fleeing OG Loc in the beginning, thereby gaining the Newsvan, which remains parked at the same location. The default radio station in the Newsvan is West Coast Talk Radio. Found atop Missionary Hill next to the building with the Sutro Tower-like antenna tower (sometimes locked). Sometimes found in the parking lot of the Los Santos International Airport. TV Van, GTA 1, GTA London (1969 and 1961) and GTA 2 equivalents. VCN Maverick and News Chopper. Gumshoe, a GTA Chinatown Wars equivalent. This page was last modified on 24 June 2013, at 09:28.